Everyone and their dad has a blog these days. No, really, Jeff’s dad is a police officer and he has a blog (FYI, Jeff is the co-founder of this site). Chances are, whether you realize it or not, you know someone with a blog, too. What you may not have realized, though, is that you can actually make money blogging. Doesn’t sound so lame anymore, does it? Blogging has afforded thousands of people and families opportunities they never dreamed were possible. Freedom from the 9-to-5 grind, the ability to contribute something meaningful to the world, even early retirement. Yeah, I’m talkin’ that kind of money. Between the two blogs we run, we pull in over $60k per month. You are your own boss, and you make your own hours. Work from wherever you want (and travel the world if you like). Personally, I prefer quaint coffee shops. The amount of money you make is a direct correlation of how hard you’re willing to work. You learn a lot about running a business and pick up valuable skills along the way. If you ever decide to go back into the workforce, you’ll have plenty of career options. Be as creative as you like — create courses, printables, art, recipes, whatever floats your boat. Make a real difference in other people’s lives. Blogging has opened so many doors for me. I get to write about things I’m passionate about (personal finance, money mindset, blogging, and business), help others, and work on projects that truly inspire me. I know what you’re thinking — But how is all that possible? Allow me to explain how this whole blogging thing works by answering the most common blogging questions we get. Can you make money as a blogger? We already covered this one above, but I’ll say it again — YES, you can absolutely make money blogging! That said, don’t get the wrong idea. Blogging is hard work, and the amount of money you make is directly related to how much work you’re willing to put into it. You can make millions of dollars, or you can make a couple bucks a month. It’s totally up to you. The income range for bloggers is pretty drastic. That’s because it doesn’t cost a lot to start a blog, so the barrier to entry is low. It takes more effort to make money than what most people realize, which is why many blogs never make any money at all. However, those who stick with it have the potential to make thousands, tens of thousands, even hundreds of thousands of dollars per month. Alexis Schroeder over at Fitnancials started her blog as a hobby in 2013. It began as a way to document her weight loss journey, but quickly became her passion and a full-time career. Alexis grew her blog while working and going to college full time. Today, she works 20-30 hours a week on her blog and makes a comfortable $4,600+ per month. That’s us! We have two blogs: Breaking the One Percent and DollarSprout (formerly known as VTX Capital). Between these two sites, we currently make a little over $60k per month. It took some time to get where we are, but if you know what you’re doing (or learn from people who have done what you want to do), you can make money blogging way faster than we did. For example, we started DollarSprout, our newest blog, in October 2017. Within six months, it made up over 60% of our company’s revenue. Granted, Ben and Jeff had been blogging for a couple years at this point. But it still goes to show that if you start out on the right foot (again, definitely learn from someone who knows what they’re doing), then it doesn’t take long to make money blogging. Lindsay and Bjork at Pinch of Yum stopped publishing income reports in 2017. Up to that point, their blog was bringing in over $100k per month. Their “blog experiment” began in 2011 while they were both working full-time jobs, Lindsay as a 4th-grade teacher and Bjork at a nonprofit. Today, Pinch of Yum is still going strong and has grown beyond a mom-and-pop blog to support a full team of employees. By now you realize that it’s definitely possible to make [a lot of] money blogging. The next question: how do you make money blogging? The truth is, no two blogging businesses are exactly the same. Online business, blogging in particular, is incredibly flexible. There are dozens of ways to earn money online with a blog, but the best way to monetize your blog depends on your niche, your ideal audience, and your personal preferences. Below are the most common methods to make money blogging. Affiliate Marketing: Earning a commission by promoting other company’s or (people’s) products. This is our favorite way we make money with our blogs, and one of the most passive blog monetization methods. There are three main ways to approach affiliate marketing: use affiliate networks, sign up for private affiliate programs, and promote products on a shopping site. Affiliate networks are sites that host affiliate programs for many different companies. These networks are super convenient for bloggers because instead of signing up with a million different programs, you create an account with a few affiliate networks and you have access to hundreds or even thousands of products and services you can promote. Some of our favorite affiliate networks include FlexOffers, ShareASale, and CJ.com. For private affiliate programs, you sign up directly with the person or company you want to promote. For example, our email service provider doesn’t exist on an affiliate network. Instead, we applied for their affiliate program individually (because we love and want to support them), and work directly with the company’s affiliate support team. And last but not least, there are affiliate shopping sites. Say you start a blog about camping where you write reviews on different types of camping gear and products. Amazon Associates could be a big money maker for your blog. Our main website, DollarSprout.com, is an example of a blog-style site that makes the majority of its revenue through affiliate marketing. Want to learn more about affiliate marketing? Our good friend and incredibly successful blogger, Michelle makes $50k+ per month from her blog with affiliate marketing alone. Learn her secrets to success. You typically see CPC/PPC ads as banners in content or in the sidebar of a website. Each time a reader clicks on the ad, you earn a small amount of money. CPM ads are based on views rather than clicks. You get paid a fixed amount for every 1,000 people who see the ad on your site. We use ads sparingly on our sites, but it’s definitely not our number one money maker. We’re not fans of getting paid a few cents to direct our readers to someone else’s website, and there are more lucrative ways to make money blogging on this list. However, display ads can be a good way to dip your toes into monetizing at the beginning of your blogging journey. The easiest way to place display ads on your site is to sign up for an ad network. Google AdSense is a popular option for bloggers who are just starting out. Payout tends to be lower than more exclusive ad networks, so don’t expect to get rich any time soon if you choose this route. Once your site starts getting more traffic, you can upgrade to a more exclusive ad network like Mediavine (minimum of 25,000 sessions/month) or AdThrive (minimum 100,000 monthly pageviews). Display ads aren’t the only way to advertise on your site. Another option is to post sponsored content. This is where companies pay you (either in the form of cash or free goods) to write an article or social media post about their product or service. The more readers or followers you have, the more you can charge to get their product in front of your audience. And you don’t have to wait for companies to reach out to you to make money with sponsored posts. If this is a revenue stream you’re interested in pursuing, start joining influence networks like IZEA, Acorn Influence, Blog Dash, and Find Your Influence. You’ll also need a media kit that summarizes your site statistics (traffic, audience demographics, email subscribers, social followers, etc.). You can use Canva’s templates to create a media kit for free. Offering services is probably the fastest way to make money as a new blogger, and there are TONS of options to choose from. If you’re tech-savvy, you could start taking on freelance web development clients. Love to write? Plenty of sites will pay you for it. I made my first $1,000+ through my site by experimenting with different service offerings. First, I took a $10 web development course and started applying for small jobs on Upwork. Then I used the content on my blog to showcase my writing and started pitching freelance writing clients. And, eventually, I decided to use my skills and personal finance background as a financial coach. However, there’s really no limit to what you can offer online. To determine your ideal service offering, take inventory of what you’re good at, what you enjoy, and/or what you have experience in. Then figure out if there’s a market of people who are willing to pay for your craft. Or, if you want to break into a certain area but you’re not sure where to begin, you may want to consider taking a course. There are courses for almost any service you can imagine, like this one on freelance writing, this one on starting a virtual assistant business, or this one on running Facebook ads for clients. Online courses can be a great way to fill in your knowledge/skill gaps and help you make money with your blog even faster. Digital products come in all kinds of formats — eBooks, workbooks, online courses, printables, membership sites, and more. Just like anyone can create a blog, anyone can also create a digital product. But actually getting it in front of the right people and selling it takes a lot of skill. However, if done successfully, creating and selling digital products can be a highly lucrative revenue stream. Take, for example, Suzi Whitford of Start a Mom Blog. Suzi creates and sells eBooks and online courses, and she regularly makes over $30,000 per month from her blog. If you have a lot of knowledge in a particular area, then this could be a good revenue stream for you. There’s no one right way to go about monetizing your new blog. However, some ways are better (i.e. faster) than others. For new bloggers, the fastest way to make some extra money with your site is to start offering services and finding clients. 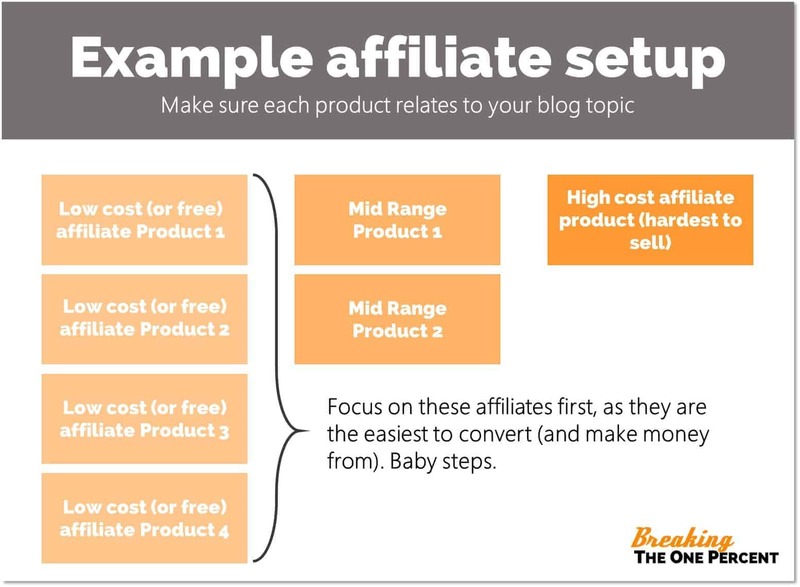 Once you’ve got some clients, you can start building up affiliate revenue on your own blog. From there, you can choose any direction you like — sponsored content, increase prices for your services, create digital courses, etc. For more information on how to start making money as a new blogger, check out our free guide to make your first $1K blogging. Thanks for sharing all those details! I’ve been blogging for over 10 years and there have been a lot of ups and downs. Lots of fun, though. Of course — thanks for being here! How are you monetizing your blog? So, I am confused. You switch the domain from vtxcapital.com and it just took off? Doesnt make sense that google would suddenly rank the site because of a name change. Any ideas? Definitely not just because the domain was changed — it was a rebrand and the old domain was redirected to the new. It combined two (albeit modest) link profiles and it helped propel the newer site forward, faster.